September brings on what could arguably be our most enjoyable weather of the year. Take advantage of the opportunity to create Make It Montco Moments using the following recommendations. As you enjoy the pleasures of our county, spread the word on the fantastic things to do and see. Use #MakeItMontco as you post your updates and photos. Thursday through Sunday, September 4-7, buckle yourself in for the family fun at the Upper Gwynedd Carnival at the Parkside Place Complex in North Wales. Rides, food and music are the highlights, and discount passes are available for individual days as well as a mega-pass that provides access for the entire run of the event. Friday and Saturday, celebrate the end of summer with a bang by gazing at the fireworks shows at dusk. Attune your kids&apos; ears to the sound of September Songbirds at Norristown Farm Park on September 6. A number of feathery friends are already on their migration schedules for fall. This is a chance to catch them in motion before their tuneful tweets are gone until next spring. Bring binoculars. Let your kids wade into a close-up (and knee-deep) look at aquatic life in the Perkiomen Creek at Green Lane Park on September 6. The Creek Critters adventure explores a great variety of insects and other invertebrates, focusing on their special adaptations for life in fast-moving water. Old sneakers or water shoes are recommended - getting wet is an integral part of the morning. 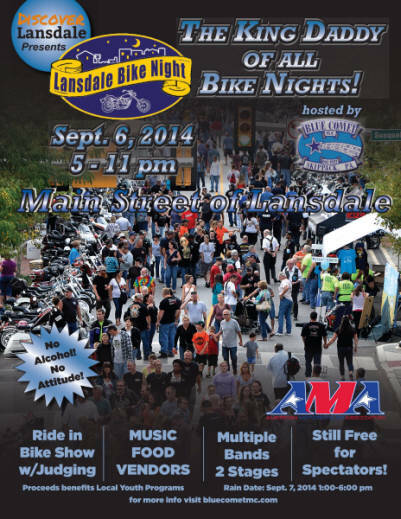 For an interesting spin on Montgomery County nightlife, steer your way to Lansdale Bike Night on September 6. Main Street is the main drag for the East Coast&apos;s "king daddy" bike rally, which draws thousands of bikers from hundreds of miles and six surrounding states. It&apos;s a night of bike contests, motorcycle club networking, vendors, food, radio stations WMMR and WMGK and live music on three stages. High-flying adventure is in abundance at the 24th Annual Wings ‘n&apos; Wheels day at Wings Field in Blue Bell. Angel Flight East hosts this September 6 event that features cars and planes that are vintage and antique, classic and unique. Indulge in the samplings from Food Truck Alley, a representation of Philly&apos;s finest food on wheels. Lick your lips at the chicken wing competition. And soar with the clouds - airplane rides are just $35. The weekend is packed with outdoor opportunities, but once the brilliant sun starts heading westward for the day, it&apos;s time to relax and rest up. Valley Forge and Montgomery County have accommodations of all kinds, from plush hotels to quaint B&Bs and inns. Let us recommend a suite that suits your needs perfectly. And if your taste buds still crave a bit of summer, opt for the Angel hair pasta with jumbo lump crab meat at L&apos;angolo Blue in Blue Bell.